Massey Klein is pleased to present Suspension, a solo exhibition of oil paintings and charcoal works on paper by Giulia Dall’Olio. This is the artist’s first solo exhibition in New York. Throughout her career, Dall’Olio has been inspired and intrigued by Ma, the Eastern concept of space. While there is no Western equivalent, Ma roughly translates to “the space between two structural parts” or the “void”. According to Eastern philosophy, this void does not represent an emptiness or even a lacking, but rather the potential for opportunity. In Dall’Olio’s latest series on view at Massey Klein Gallery, we see her fascination with space progress. No longer focusing on the area between objects, as seen in previous works, the artist concentrates on individual elements, zooming in and using the negative space to balance the composition. In doing so, emptiness becomes substance. The paintings no longer portray the natural world but rather the relationship between form and non form and the interludes that give shape to the whole. At once, we have the sense of traveling through, and remaining still in space. Atmospheric perspective pushes the foreground while a gentle vignette lends itself to continuous perspective. It is in the artist’s charcoal works that we see her skill as a draftswoman. The artist’s focus on a single tree, branch, or bush draws attention to the poetic qualities of nature. While representative of the physical world, the suspension of the subject and absence of compositional ground cause each form to become abstractions of their natural counterparts. Giulia Dall’Olio (b. 1983, Italy) lives and works in Bologna, Italy. The artist paints mystical utopian landscapes rich with abstraction. 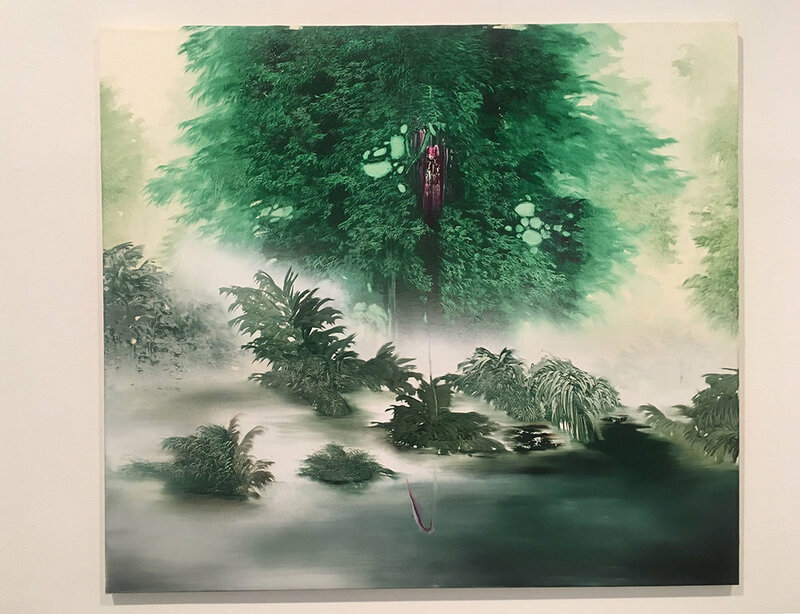 Her oil on canvas paintings are dense with layered visual material: murky trees are disrupted by meandering carvings and beautiful washes, as if there’s a gentle rain veiling the composition. The works are polished but purposefully obscured and draw upon the classical genre of landscape painting.